In fact, the boiler to the right is a combination (combi) boiler, which is a great option to conserve space for a high-efficiency water heater and central heating boiler. As a combi system, these two systems are together in one! 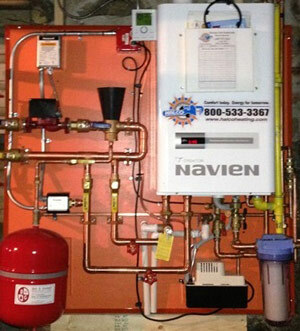 Today, new gas boilers are available that operate at 90% efficiency or more. Halco can evaluate your current heating system and provide a free quote on a super-efficient system that will save you money. Call or email today for a free quote. We are your trusted resource for home heating systems including boilers in Rochester, Ithaca, Syracuse, Webster, Auburn, Fairport, Pittsford, Cortland, Canandaigua, and more! Call 1-833-844-2622 or contact us online to schedule a free home inspection and boiler estimate. We also offer a comprehensive home energy assessment.